T�tszentm�rton is a Croatian "Kaj" village in Zala county on the left bank of the River Mura in Hungary. The settlement has got 955 inhabitants (74,1% Croatian). The flag is at <totszentmarton.celodin.hu>. 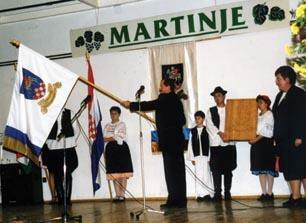 Another photo of the flag at <mura.celodin.hu/marton.htm>.